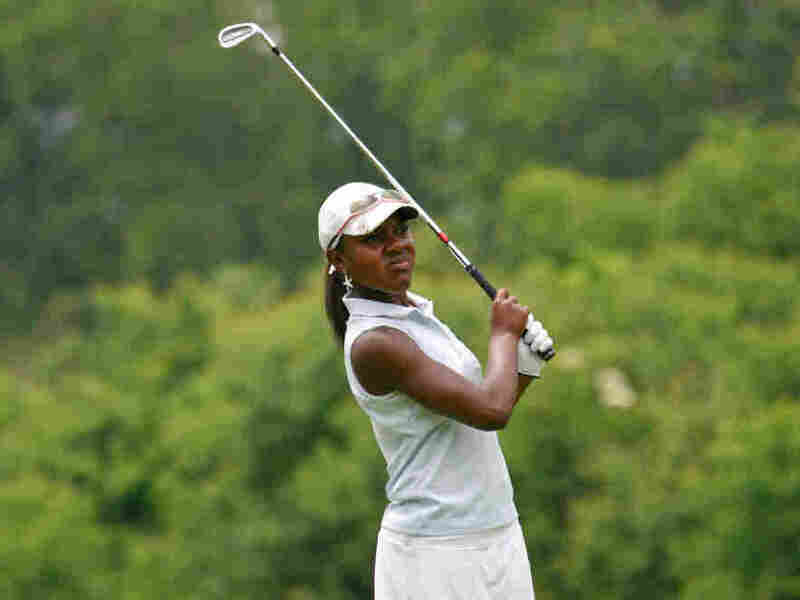 Teen Golfer: Don't Compare Me To Tiger Mariah Stackhouse, 17, is the youngest African-American to qualify for a U.S. Women's Open, and was the only black qualifier in the 2011 tournament that ended in early July. She tells Michel Martin about how her golf career has grown. Mariah Stackhouse competes during the first round of the American Junior Golf Association tournament at Steelwood Country Club in Loxley, Ala., June 6-9, 2011. Those who follow sports — particularly golf — have probably heard of Rory McIlroy. He topped the world Amateur Golf rankings for a week at age 17. Then at age 22 he became the youngest winner of the U.S. Open since Bobby Jones did so in 1923. But another young golfer is burning up the links right now: 17-year-old Mariah Stackhouse. She has competed in nearly 200 golf tournaments, won half of them and scored in the top 10 in almost all of them. She's the youngest African-American to qualify for a U.S. Women's Open, and was the only black qualifier in the 2011 Open that ended earlier this month. Now she's swinging her clubs at the U.S. Girls Junior Amateur Championship in Chicago that's finishing this weekend. In an interview with Tell Me More host Michel Martin, Stackhouse says her introduction to golf came from her father Ken. He took her along when he went golfing. Mariah Stackhouse receives an award from the American Junior Golf Association tournament at Steelwood Country ClubÃÂ in Loxley, Ala., June 6-9, 2011. "And about when I was 2-years-old, he cut down a set of clubs for me. I began to practice alongside him, and he never stopped taking me. I guess I developed a liking for the game, I kept practicing, and here I am now," says Stackhouse. She says she likes the game because it lets her simultaneously compete and converse with opponents. She contrasts that to basketball and soccer, which she says gives her little time to get to know other players. Stackhouse describes golf as an "open sport." Anyone who wants to play can do so. But she says it's important to relax and not put too much pressure on oneself, emphasizing that players must be patient when striving to improve. Now that Stackhouse has gotten so far, the superlatives used to identify her include "the first" or "the youngest" to accomplish something prestigious. Stackhouse says when people use such titles, it just shows that she is doing something right. But she doesn't place herself on a pedestal. The people who call her "the next Tiger Woods," she says, are those who do not play golf. "If you know golf very well, at 17 years old, Tiger had won some amazing tournaments. I've done well in quite a few, but I haven't made any of the accomplishments he's made in terms of the caliber of tournaments that I've won. I think it's just a comparison made on the fact that we're both young African-Americans in a sport that there aren't many of us out there playing," she says. And while Tiger Woods has publicly discussed his experience with racial discrimination, Mariah Stackhouse says she has not experienced race or gender-based hurdles. Stackhouse doesn't think she'll be denied any opportunities in golf, but she's still creating her own safety net through education. "You don't know where a sport can take you, so I want to make sure that I have an education behind me in case things don't work out," she says. Stackhouse, a senior at North Clayton High School in Georgia, will attend Stanford University in California in the fall of 2012 — just like Tiger, it should be said. She says she is interested in pursuing a business-related major and a science minor.